Everyone is on social media, but not everyone is compelling. I'm sure you've seen the social media super stars with tons of raving followers. Ever wonder how they got where they are and how they differ from those who just have tons of followers that don't engage? Well, there are a few things. I love spoiling my friends, and that means if I know it, you know it. So today I thought it'd be perfect to discuss some things that you can do to build your brand and your relationship with your audience to create loyal and raving supporters. So in true Kelley fashion let's get straight to the point. 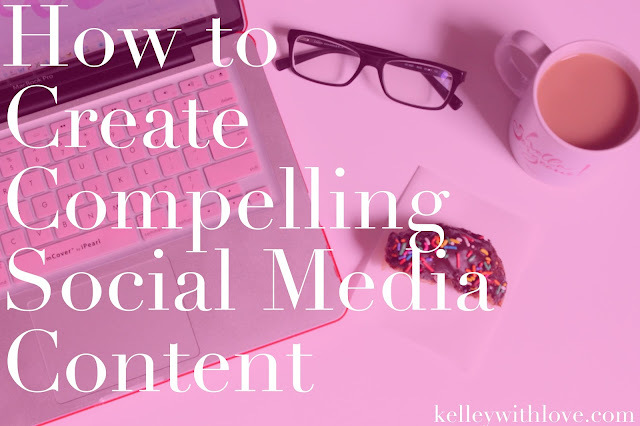 Check out how to create compelling social media content below. Compelling content is content that provides value and inspires action. When you provide your audience with value you position yourself as an expert and you give them a reason to keep coming back. Valuable content usually solves a problem, address an issue, or inspires change. Before creating content research your audience to get to know what the need, want, enjoy, and have trouble with. Then research any other brands that may already be providing the answer. Once you've done this you'll have a better idea of how you can help and in a way that hasn't been done before. When you really want to take it to the next level, you won't stop at just providing value. Often your ideal client will initially be interested in you because you are providing value. If you want that ideal client to continue coming back and to share with a friend then provide actionable steps that he/she can take to achieve desired outcomes. In essence it's like telling someone the name of the best cupcake place in town and then providing step by step directions on how to get there and throwing in your top three suggestions. See, you basically just went from strangers to best friends in the matter of seconds. That's exactly how you want to connect with your ideal client and become a permanent part of their lives. The proof is in the pudding. Walk the walk, talk the talk. You get where I'm going here? If you want to seal the deal show your audience that you're about your business. Show them the results that you've achieved by using the value and actionable steps you're providing them. This will show that you are trustworthy, confident, and most of all authentic. This can be in the form of testimonials, reports, or really anything that shows what you or others you've helped along the way have been able to achieve. Once you start to implement these three steps you will notice that you will attract your ideal clients, increase your followers, and increase engagement with your ideal clients. Like I said, what I know, you know. Now can I ask you a favor? After you've had a chance to implement the steps above could you come back and comment in the comment section below about your results? Can't wait to hear how it works for you! You're also invited to sign up for some new upcoming goodies that you can only get if you're on the list! Thanks for another awesome post, Kelley! I've been trying to increase my visibility on Instagram and Facebook and I'm sure these tips for creating compelling content will help tremendously! Great post! I love the steps you have suggested. I am always looking to grow my following! This is great info Kelley! I totally agree. Being purposeful and valuable with social media is a way to attract your ideal client and gain a loyal audience. It's also important to hone in the social media platform that caters to your audience the most.